In 1822, the French-Canadian voyageur Alexis St. Martin experienced something that would earn him a permanent place in the gastroenterology textbooks: an accidental gunshot that left him with a permanent hole through the left side of his chest and through to his stomach. The unfortunate injury would have had little scientific importance, except for an army surgeon name William Beaumont who swooped in to offer medical support and quickly realized the opportunity St. Martin’s injury afforded. Here, thought the surgeon, was a one-of-a-kind window into learning more about human digestion. So, with a little convincing from Beaumont, St. Martin became a walking experiment. He reportedly sat for hours on end while Beaumont tried one trick after another: tying a piece of meat to a string, for example, then inserting it through St. Martin’s chest hole and pulling it out after a certain time had elapsed so he could observe any changes. Beaumont would drain gastric juices from the hole and keep it in vials, dropping in various kinds of foods and watching them disintegrate. Nowadays, scientists have more questions than ever about human digestion. But if their knowledge about still relied on freak accidents and ethically questionable subject recruitment (as in the case of St. Martin), they wouldn’t know much more than they did back in 1882. Fortunately, scientists now can recreate the actions of various parts of the digestive tract in vessels of glass and steel. SEE ALSO: What Is The Autism-gut Connection? One modern system for studying digestion, called “Robogut", has been developed by molecular biologist Dr. Emma Allen-Vercoe in her lab at the University of Guelph (Canada). 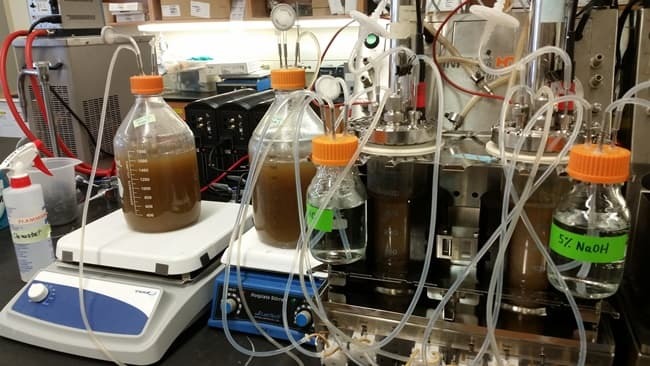 Robogut is a bioreactor that allows researchers to study the colon: a part of the digestive system slightly lower in the body but perhaps higher in importance than that studied in St. Martin. The colon, of course, is home to the trillions of microorganisms (mainly bacteria) that help us digest what we eat. And the only thing Robogut needs in order to mimic the activity in a human colon is a stool sample. “You don't have to ask permission to [run] it," says Allen-Vercoe at her office in Guelph. “We do have to get ethical approval from patients to get stool samples, but it's a one-time thing." She explains that she and her lab members take each sample and work to separate it into as many different bacterial species as they can. Then they define a “community" based on the list of all the species they find, and mix it up in Robogut to see how it behaves. “Once you have that defined community you can put that together in Robogut any time you want," Allen-Vercoe says. “Because you're defining the ecosystem, you can make that ecosystem over and over again." This eliminates variability between experiments—a constant problem when working with human stool, since no two samples are the same. Allen-Vercoe says the system also makes it possible to look at what byproducts are produced by the microbes when they are fed different nutrients. Lab members give Robogut compounds like resveratrol (famous for lowering the risk of heart disease), or even pesticides, to see how they handle them. Robogut doesn’t account for everything in digestion—for one, it lacks information about important microbial interactions with the human immune system—but it does help the researchers zero in on things that can later be tested in humans. Other laboratories around the world have developed in vitro models like Robogut to test hypotheses about human digestion. Each one has its strengths and weaknesses. The HuMiX, or “human-microbial crosstalk" system, developed at the University of Luxembourg, has a chamber for cells from the inner surface of the human gut, and a separate one for microbes, so it can investigate interactions between the human host and bacteria. The “gut-on-a-chip" approach, on the other hand, mixes up microbes and living human gut cells in thin tubes that are mechanically deformed in short pulses to mimic peristalsis (the wavelike movements that push food through the digestive tract). The different models are useful for different questions, but one thing is certain: we will never return to the strategy of tying food to strings and forcing it through a hole in a man’s chest. Through beakers and tubes, we will progress a long way toward understanding the extraordinarily complex process of human digestion.